Tempted Ways Six: This six-unit townhouse complex enfronts Prospect’s central pedestrian greenway. 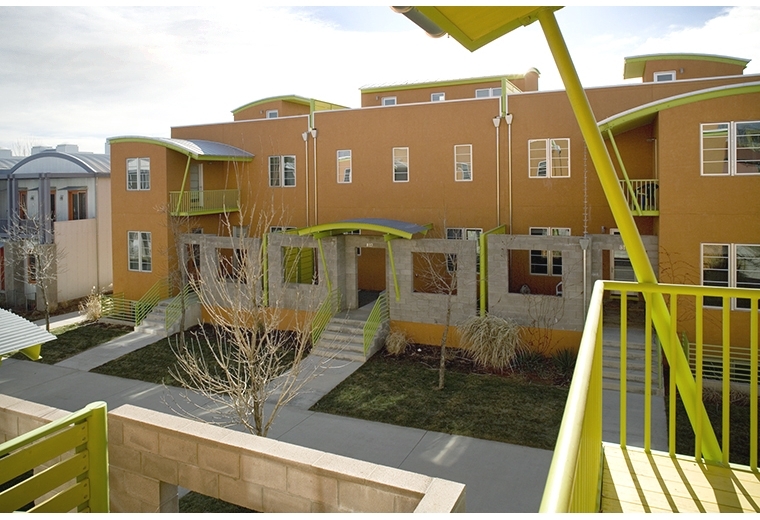 Each three bedroom unit is sheltered from the adjacent public way by a walled entry court, raised three feet above sidewalk grade. All have additional private exterior spaces in the form of rooftop terraces, giving every unit clear mountain views. The attached, alley-loaded garages are entered at grade, allowing the front and rear section of each plan to be offset a half story. In the southern three units, the grade differential allows direct communication between the main entry level and the studio/living room over the garage.